Get with the system. A total basement waterproofing installation can include a sump pump system equipped with battery backup (to keep working during a power outage) and a basement dehumidifier that removes mold spores and dust while drying basement air. If your existing sump pit doesn't have a cover, now is the time to install one. An exposed sump can collect debris that blocks the pump and allow nasty odors and dangerous radon gas to enter the basement. 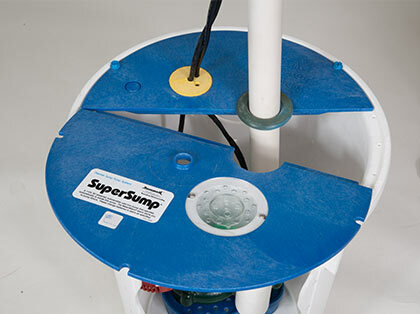 All sump pump systems from Basement Systems include a durable, airtight cover. Includes a basement floor drain to admit water from a plumbing leak or other source. Gives the sump pump system an attractive finished appearance. Easy to remove when servicing sump pump. Looking for pricing on a sump cover? 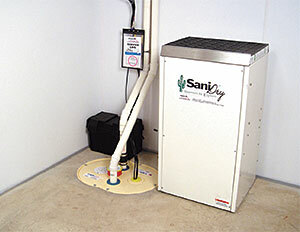 Basement Systems sump pumps are installed exclusively by authorized dealers throughout the United States and Canada. Call us at 1-800-638-7048 to request a consultation and get a free cost estimate on a new sump pump installation.